I’m really sorry to my non muslim friend. Some of the images might not suitable for you. Last year, my family and I did Ibadah Qurban for the first time. I’m not from rich family and this is our first time perform Ibadah Qurban. We understand and we knew the benefit and the importance of Ibadah Qurban. It’s not only about our duty as muslim but it is more than that. Ever since we did the Ibadah Qurban, thanks to the Allah who is the almighty, we can see the changes in our life. I never know our life changes will influence other and I’m glad that this year my family and I decided to perform another Ibadah Qurban and make it as our yearly activity. Inshalllah if the Almighty let us to meet again Hari Raya Haji. Hukum menyembelih qurban : Menurut madzhab Imam Syafi’i dan jumhur Ulama adalah sunnah yang sangat diharap dan dikukuhkan. Ibadah Qurban adalah termasuk syiar agama dan yang memupuk makna kasih sayang dan peduli kepada sesama yang harus digalakkan. With almost 10 years of experience, EZ Qurban is no longer a new player in this industry. So, you don’t need to worry with their services. One of my favourite radio channel is Ikim FM (islamic radio channel) and I always heard about EZ Qurban. Guess what? On my last Media FAM trip to Medan Indonesia, I met my new friend Faizal Eshak from EZ Kembara. Yes, I know what you have in your mind. EZ Kembara and EZ Qurban are under the same parent company. I’m going to talk about EZ Kembara in some other time. Mr. Faizal Eshak told me a lot about EZ Qurban and in conjunction of the upcoming Hari Raya Haji, EZ Qurban is having promotion for those who are interested to perform Qurban. Well, the fun thing is, the Qurban is not only limited in Malaysia but they do serve other Muslim too in other country such as Cambodia etc. How beautiful is that? Hopefully one day I can follow them to other country to perform Ibadah Qurban. 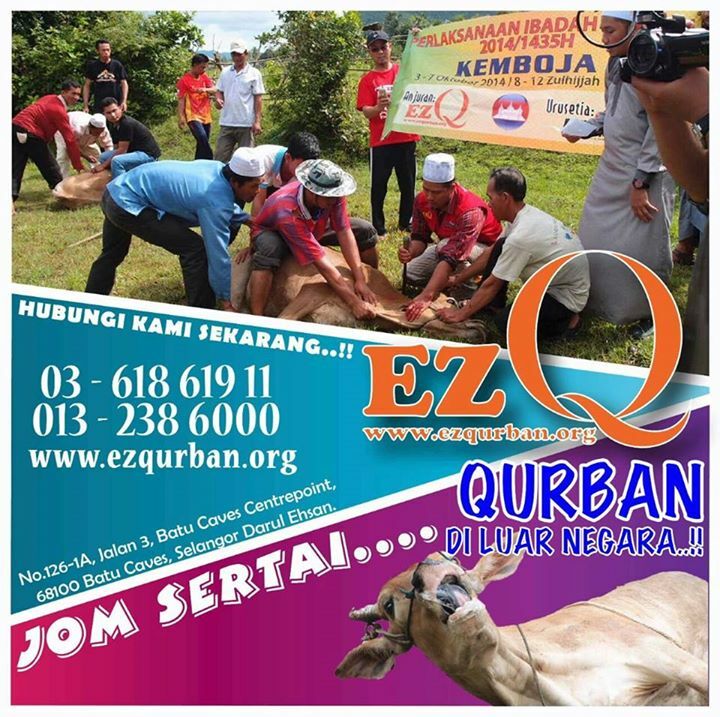 For those who are interested to know more information about how you can perform Ibadah Qurban, you may want to visit their website: ezqurban.org or directly contact them at +603 618 619 11. Some of the photos that I took last year during Ibadah Qurban. How to register for Qurban? How to register for Aqiqah? Do you want to visit their office?